A short time with a lot to experience! You’ll stay in a comfortable Eco-Hotel at the horse farm and experience pleasant riding through scenery formed from past volcanic activity and today’s bubbling hot springs. This 55 km tour departs every day, and riders can join on any day. It’s a good introduction to horse touring - most travelers use this as a part of a longer stay in Iceland for other activities and explorations - and we can set up a variety of other things to do and see. Americans fly out on the night before the tour begins in Iceland. Travelers from Europe can leave on the same day that the tour starts. After your arrival at Keflavik International Airport you’ll take the Flybus shuttle to a comfortable hotel in Reykjavik, and have the day free for exploring. We’ll provide a list of interesting things to see and do, and some restaurant ideas. Your first night's accommodations (as well as your last night's) are included in the price. You will be picked up at your Reykjavik hotel at 8:30 AM by Eldhestar, and taken to their farm in Hveragerdi, about 40 minutes from the capital. Riding starts around 9:30 AM. Following the old route to the plateau Hellisheidi, riding across the moor to the volcano Hengill and over the lava field Kristnitokuhraun, the sure footing and agility of the Icelandic horse shows at its best. This lava came from the eruption of Hengill during the year 1000, the same year Iceland officially became Christian. Legend has it that the eruption was revenge of the old Gods. 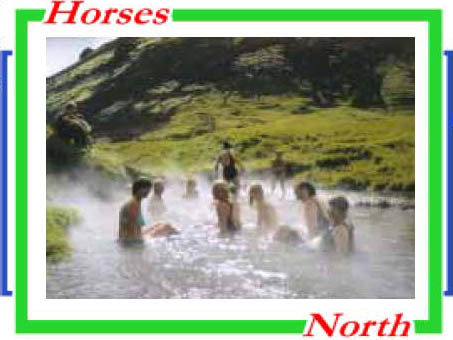 Riding through the Hengill area, there are hot springs and unusual cliffs including Reykjadalur (Valley of Steam). A nice soak in this warm rivulet is quite unforgettable.Then it’s back to the Hotel for a nice dinner and good nights sleep! 5 - 6 hours on horseback. Riding out from the farm, an old route is taken along Ingolfsfjall, the mountain named after the first Norwegian Viking who settled in Iceland. The Olfusa river is followed to the old Arnarboeli Cemetery over fields and meadows. From there we have a view over the river and to the famous volcano Hekla. The Olfusforir Bird Sanctuary is visited before the return to Vellir with a total of 20 km riding for the day. During the winter a part of this tour will be used for a riding course at Vellir. A talk about the Icelandic horse - in history and contemporary life - will be presented. The weather and the wishes of the participants will determine how much time we will be on tour and how much time is spent riding at the farm. Riders are driven back to a hotel in Reykjavik, arriving in Reykjavik around 5:00 p.m. 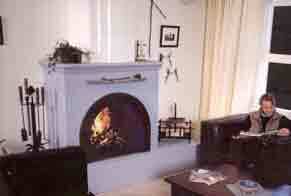 The Volcano Contrasts tour runs all year round, starting every day that there is room at the farm. This is an ideal tour to combine with some other exploration of this fascinating country. During the winter - when snow or mud may keep horses out of high valleys, more riding may be done in the delta around the farm. Or one day may be used for a riding course at farm. A talk about the Icelandic horse - in history and contemporary life - will be presented. The arrival day in Iceland is always a transfer day, which allows you to rest from the short night of sleep on the flight before you start riding on the second day. *Price includes round trip airfare, including fuel surcharge and departure tax, from Boston, New York, Minneapolis and from Washington Dulles International Airport (ask about prices from Seattle, Toronto, Halifax and Europe.) Also includes all airport transfers, hotel accommodations before and after the riding tour in Reykjavik with private bath and breakfast, a comfortable hotel room on the outfitter's farm during the ride with private bath, all meals during the ride, as well as safety helmets and rain gear. Not included in the price are travel insurance, breakfast and lunch on your arrival day, lunch or dinner on the day of departure and the cost of any additional travel you may choose.